Thanks to the invitation we received from Eplan, the electrical design software we are using at Ateknea, we heard about the first edition of the “Advanced Factories” conference, held at the CCIB Barcelona, located at Fórum. Our Industrial Processes department swiftly organized a visit on one of the exhibition days, as the conference’s slogan “discover the latest in machine tools, industrial automation and software to transform your business” was of interest to all the people in the department: electrical, control and automation, and mechanical. Regarding Control and Automation, we could experience firsthand some of the latest innovations not only of the leading brands in this sector such as Eplan, Rittal, ABB, Rockwell Automation, Festo, Weidmüller and many others, but also from manufacturers hitherto unknown that may be an option for future projects such as IronTech, a company based in Girona (Spain) that is dedicated to the design and manufacturing of industrial computer hardware. Robotics, as sector with dynamic growth, was very well represented with some collaborative robot model by brands such as Kuka, Fanuc, Universal Robots or Yaskawa. Apart from the exhibition itself, there were a series of presentations and speeches related to Industry 4.0. There was also a “Factory Innovation Theater” that hosted short presentations of solutions and products. If we had to highlight a particular product, we would choose the “ThinManager” by Rockwell Automation. A factory visualization management software, operating on Zero Client type screens (without operating system). The software allows managing factory visualizations, on thin clients or light clients, providing advantages such as the reduction of deployment costs, maintenance and update of the application and the possibility of connecting to the server of the application from heterogeneous devices (BYOD – Bring Your Own Device). Among the benefits are: configuration and centralized management, quick replacement of terminals, time and money savings as well as managing users by adding an extra layer of security. Related to Machining and Manufacturing, there were large manufacturers of machining centers as well as a wide range of suppliers of parts and technical solutions for our prototypes. 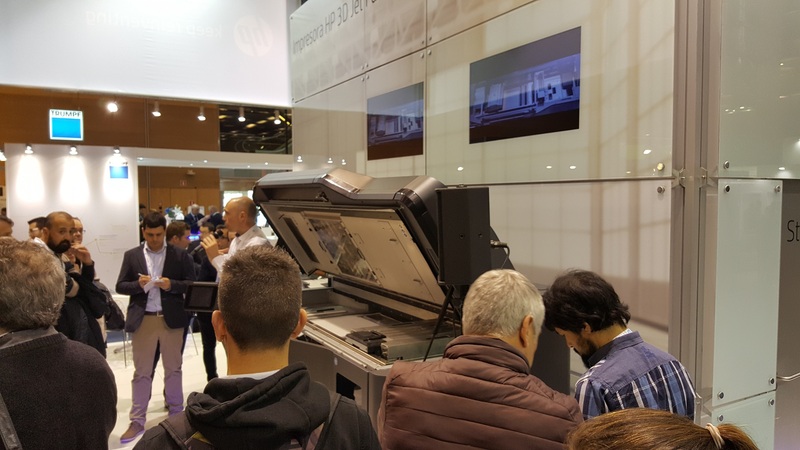 We were able to take a close look at new manufacturing technologies, such as the new HP 3D printer, the Jet Fusion 4200/3200, that achieves to 10 times faster print speeds, cutting manufacturing costs by half and maintaining excellent mechanical properties. We also saw the new low cost planetary gearboxes from IGUS, which are very useful for applications without heavy loads, and guides with wear sensors, for intensive applications. We met with regular suppliers like FESTO, PROTORAPID or IFM, and enjoyed their candies. We saw the different types of machining centers, and the different forms of machining that we use to create the more complicated pieces, and we closely checked the surface finishes of the different 3D printing technologies. We also saw the different methods manufacturers have discovered to improve FDM prints and confirm that the latest improvements made to our small 3D printer are in line with the quality of the latest machines. Concluding with 3D Technologies, we were able to check out the latest developments in the metrology sector by leading companies such as FARO, RENISHAW and ZEISS. Within this sector, we were impressed by the 3D Scanner that allows the creation of 3D models in a wide range of sizes, considerably reducing design time and increasing accuracy when creating the model. This first edition of the conference has been great and a second edition is scheduled from March 15 to 18, 2018. We will save the date!